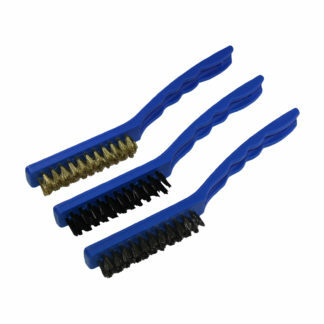 27222 GRIP 3 pc 9" Wire Brush Set 1 Brass,1 Stainless 1 Nylon Description Use for cleaning all kinds of hard to reach areas around the home, garage, or workshop. Strong ABS construction with contoured grip. Unique angled design allows for access to confined areas. 1 steel, 1 stainless steel and 1 brass.